Although I don't normally where a lot of make up on a daily basis, I do enjoy a regular routine about washing my face with certain products especially during the winter months. As I'm sure many of you know, all products work best with your own skin. 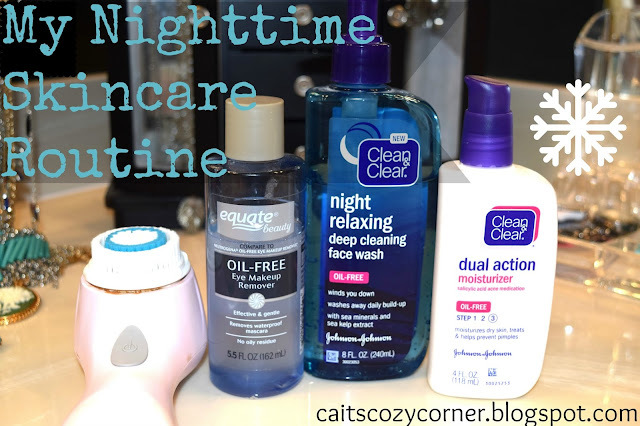 My skin is dry so to keep it looking a healthy glow and moisturized all year long, these products are a must. I use them at night right before I go to bed and the results the last few months have been incredible. My skin feels smoother, softer and above all, looking healthy. 1. Clarisonic Mia 2. I’ve had this over 4 years now and swear by it. I use it every other day to help exfoliate my dry skin patches and can tell a different immediately. My skin does tend to get red in certain areas but I love the way it makes my skin feel as if I came back from a day at the spa. It's honestly been a life changer. 2. Oi-Free Eye Makeup Remover- I'm not kidding when nothing gets my makeup more ( besides the dirt and grim of my Mia ) then this remover. I love that it's oil free even though I don't have oily skin but it actually adds a bit of moisture to my skin after I use it. 4.. Clean and Clear Moisturizer- My skin needs a lot of re-hydration during the cold months and this little beauty does the trick to making it feel refreshed again every time I use it. I love that I can conveniently carry it in my purse too if I feel like I need to add some on throughout the day. What is your skincare routine? Do you enjoy Clean and Clear products? I have the Clarisonic Mia too! Last night I got halfway through and the battery was like "recharge me!" argh!! I hate washing my face with my hands!! I need to get one of those Clarisonic things! I have a pretty basic skin care routine but I think since I'm getting older I need to up my game. Clean and Clear has always been my go-to! I've never tried a Clarisonic, but it's on my list! I love the Clean & Clear night time face wash. I just don't know how good it's going to be anymore since they've banned "microbeads" from all products.